Can I just say that I am shattered. If I stop now and sit down I will slump over while I stare into the distance and possibly dribble a bit. The party is done. We survived. Actually, it was great fun. The nice bouncy castle people upgraded our inflatable to one with a roof, for free and unasked, when they knew what the weather would be like. But apart from one brief shower, the rain held off and the sun even came out. Below is a photo of said bouncy castle filling our entire back garden. It's not that the bouncy castle is huge, it's more that our garden is very small. I am standing in one corner and our neighbour's wall is behind the castle. Luckily we live near lots of parks! It was too cool and windy too eat outside as I'd hoped, so we had an indoor picnic consisting of mini burgers, chicken nuggets, fries and salad. No child would touch the salad until one Dad there told them all to think of it as a bushtucker trial and bet them that they couldn't eat any...of course then they all ate the salad. The individual bottles of strawberry milkshake were a huge hit. I will definitely do that again. There were no breakages - the bottles are really quite sturdy - and they are much less inclined to spill than those paper cups which seem to tip over at the earliest opportunity. In the last week, Angus has requested a car birthday cake, then a tiger birthday cake, then finally a green monster cake. Which frankly was a relief as the green monster was easy to bake and fun to ice. I've recently had a revelation regarding kid's birthday cakes which goes something like "You are not a professional cake decorator. Give yourself a break." The cake is the buttermilk birthday cake from Nigella Lawson's How To Be A Domestic Goddess, my go-to birthday cake in my go-to baking book. 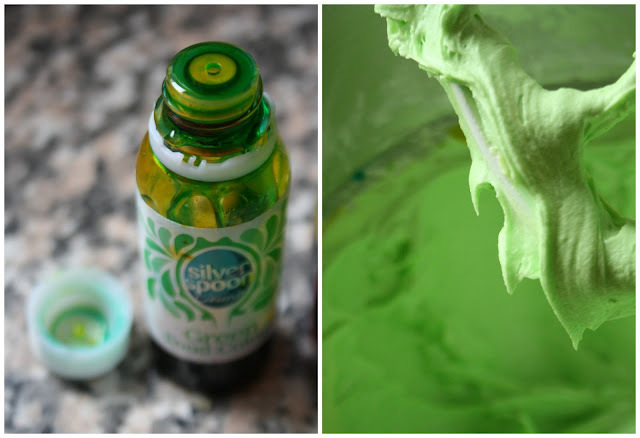 The buttercream icing is horribly, perfectly green and it was great fun to make. Angus grinned and said "My green monster cake!!" when he saw it, so at least he could tell what it was. I made about one hundred (no, eighteen) strawberry milkshakes cupcakes from Hummingbird Bakery: Home Sweet Home. They are yummy but my word, they are sweet! Tooth achingly sweet. I decorated them with cut up paper straws. I like to see a mass of cakes lined up before a party, like a little cupcake army - it makes me feel like I've done something right. If all else fails, there will be cake! And remember those sunflowers? I potted ten in little plastic pots and added a bow. With a cupcake and a balloon, they made for very economical and hopefully fun party bags. Here is the birthday boy, wearing a mask that someone left behind, happy, probably quite over tired and definitely over fed. Today we met up with John's parents in York. We visited the National Railway Museum, always a hit, and had a lovely lunch out. A great day, and we will all sleep well tonight. Happy Birthday Angus. You are four today. My baby, my big boy, stubborn, affectionate, questioning, quiet in company but non-stop chatty at home, hater of vegetables and liker of Peppa Pig, quietly adoring of your big sister and beloved by everyone in this house. Last weekend, this little blog was featured in The Telegraph. I am both very happy and very shy about it. Many thanks to those who happened to read it and sent lovely emails and messages. And many, MANY thanks to you out there who visit here and read, old followers and new, nearby and thousands of miles away - it's really wonderful to me that you stop by and your comments continue to make my day. Those burgers are making my tummy rumble. It all looks fantastic and congrats about the mention.....wow!! Good to hear the party was a success. (Take it from me, you'll blink and find your 4 year old boy is 24 and celebrating his birthday in a bar somewhere!) Well done, too, for making it onto the Telegraph's list. Happy Birthday Angus. Love the idea of the sunflower seedling in the party bag. Congratulations on making the papers! I had a little look at a few of the other blogs in the list, none appealed aside from yours, I think you have a good mix of subjects in your blog, and it is very stylish. It all looks so fun and wonderful! Happy Birthday to Angus! I have to say that you give the best party bags! The sunflowers are such a fun idea! Congrats on being featured in the Telegraph...very well deserved!!! I hope you have a relaxing week! Wow, the Telegraph, well done!! I'm glad the rain held off for you, bouncy castles are so much fun!! I love your mini burgers and strawberry milkshakes cupcakes. And what a lovely idea to put sunflower plants in the party bags, so much nicer than lots of plastic rubbish - I think! My mouth is watering at all those treats! And the party bag goodies are a great idea. I'm so pleased the party went well. I'd missed your mention in The Telegraph - congrats! Brilliant party food, and inspired party bags. I hate the excess of party bags. A load of plastic tat that ends up behind the sofa. Or trod on (ouch). I think it's fantastic that you had a mention in The Telegraph. I love your blog, and I admire your wonderfully creative mind. Well done you. Looks like a wonderful party, I am not surprised you are shattered! I love the milk bottles and sunflower plants for the party bags, I bet they will all be nurtured and loved, far better than a load of plastic any day! What a fantastic party! The food looks great and the cake fantastic! Happy Birthday to Angus. Congratulations on your newspaper feature, that is fantastic and absolutely so deserved. I really really love visiting your lovely blog. The Telegraph well done you, Cherry.......publishing deal, Go Gillian!!!!!!! Wow well done! Brilliant news. Glad the party went well and The Telegraph, is that just an online paper or is it one you buy. I looked at it and found lots of ads for Oz. Anyway well done you. Looks like a wonderful party and what a spread. I think you did a great job and deserve a pat on the back. PS: Great trick on getting the kids to eat salad. I'm filing that away for use next time! Hi Gillian! I can't even imagine the volume of your cooking and preparations! Everything looks great. And what a wonderful idea about the sunflowers! Ingenious! By the way - could you please tell how long it took for the sunflowers to sprout? I planted mine 3 days ago and still nothing! I am worried. How lovely a party that looks! And I LOVE the cake! Bet you deflated like the castle that night, eh? And congrats on the Telegraph mention! Hi There, Your party looks like a lot of fun,I think I would have loved all the nice goodies and then to go home with a little sunflower, wow,that's a super idea!! !No wonder the press was interested!! !Well done!!! Happy birthday to Angus, I'm so pleased that the party went well. It sounds like lots of fun was had by all. Congratulations on the mention in The Telegraph, well deserved. Belated birthday wishes to Angus, I'm so pleased for all that the party went so well and that the cake was a winner! We had a bouncy castle in our back garden as part of our wedding reception, hardly anyone could resist having a go. Many congrats on the mention in the Telegraph, you deserve it. That really looks like a great party! That looks like a brilliant party and I love the straws in the cupcakes - lovely detail. What a party! Way to go, Mom! That cake looks adorable! I love its eyes. I like your choice of items for the loot bags. Very different - and economical! What an adorable party! I love all the detail. I remember bouncy castle parties as a kid - they were the best! happy birthday, big boy!!!!! what a great party you had!!!!!!! 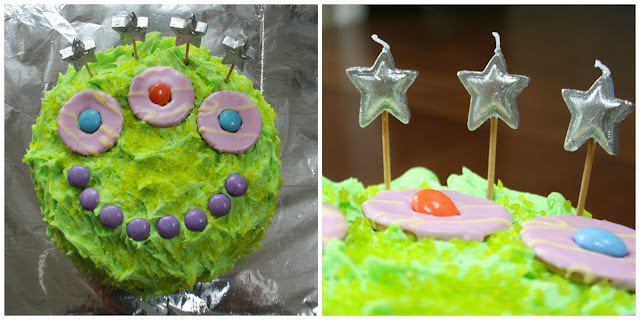 The perfect little boy's party - monsters, cake and bouncing! LOVE those party bags - inspired I call it. Party bags piss me off enormously. How lovely to see a return to the original 'slice of cake to take home' idea with a real live growing token too. Fab. Will be nicking this one, ta!